The gate will give you peace of mind by preventing your dog from running, or scooting, out of the house unexpectedly. I know a lot of quick scooting paralyzed dogs who can dash through a doorway faster than their owners can catch them. This giveaway is being sponsored by Walkin’ Pets. I am not being compensated to share the information contained in this post. The opinions and content are mine. 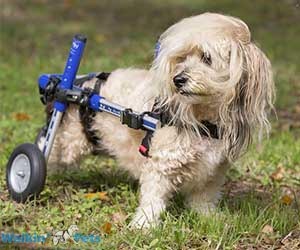 Most pet parents know about Handicappedpets.com for their dog wheelchairs, but their expanded line of products include everything imaginable to make life easier for aging and disabled pets. First, it can be installed on your front door so guests can come into your home without your dog pushing through the doorway. It’s also great for blocking the doorway when deliveries are made. And second, the retractable gate can be used on an interior door when you need to confine your dog to a specific room. This is a good option for dogs who need to stay in a small space while they’re recovering from surgery or an injury. The gate is 33” high and fits openings up to 51” wide. It’s easy to install, easy to use, and you keep it clean with a damp cloth. The gate attaches to the wall next to a door. And when you don’t want to use it, you simply unhook it. We’ll be announcing the winner on Valentine’s Day 2019! Good luck to everyone. Please feel free to share this Giveaway offer with other pet owners of handi-capable fur kids. Here’s a video that shows the Don’t Let The Dogs Out – Retractable Pet Gate in action. My Mom would love to win this gate even though we don’t want her to have it! The up side is that she would not step on our toes or trip over us in the kitchen if she had it, but that would also mean we couldn’t catch any “mistakes” that hit the floor while she is cooking! Mitzi, Please let Meeka and Glory know they are entered in the giveaway. Cheyeanne, You and your crew are entered in the giveaway. This would be great for our Pug she goes anywhere in her Quad Wheelchair and when we have the back door open she thinks she can still got out the door. Debra, You are entered in the giveaway. Marilyn, Your girls are entered in the giveaway. My puggle, Chocolate, s in the process of getting a wheelchair. For now he loves to lie on the floor with the door open so he can see what is going on outside. Unfortunately he scoots right out the door and has fallen on the step. Once he has the wheelchair, I’m worried he will try to down the step. Jo, Please let Chocolate know he is entered in the giveaway. I have a large pack of pet therapy dogs. This is a great product that I could use. Lsine, Your pack is entered in the giveaway. My cat, Bugsy, has pretty bad arthritis so he couldn’t jump over the gate. But I like to keep the door open sometimes and he WILL escape when I do that. This, however, would keep him in and he could sit on the other side and still see what’s going on outside. Carolsue, you are entered in the giveaway. Wally loves to play in the garden but there are always people coming in and out. This gate would be great to help keep our precious little blind treasure Wally safe. He could get fresh air and stay safe!!! Max and Jaxon, please let your mom know you are entered in the giveaway. I would love to win this gate for my Husky and kitten. I have a Siberian Husky named Jaxx and a 7 month old kitten named Raven. They both run to the door every time someone knocks. It would also be awesome for when I feed the stray cats that love around. Rachel, Thanks for your interest, but the giveaway ended Feb. 12. Hope you’ll take part in our next one at the end of the month.